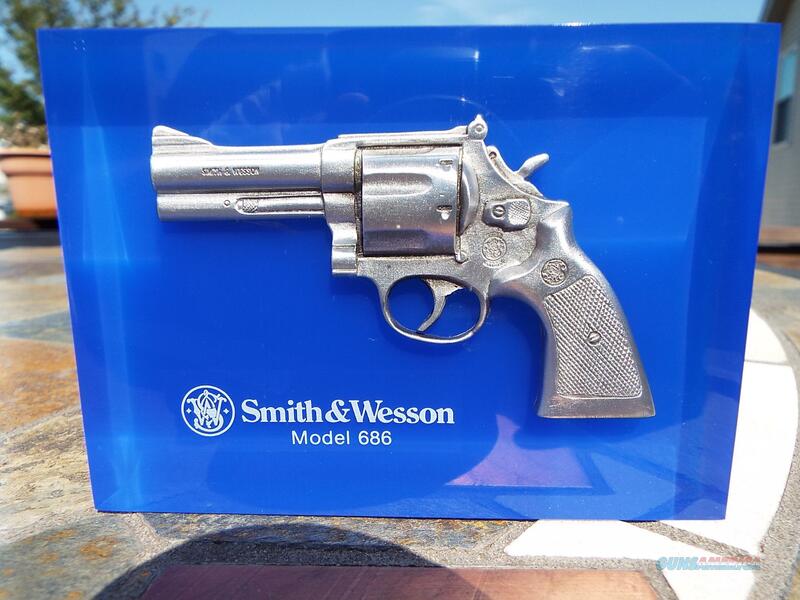 Description: Like New, Smith and Wesson Block Lucite Advertising Display Case for the Model 686 revolver. BLUE and BEAUTIFUL. Serious eye candy. A silver miniature S&W M-686 is encased. The handguns details are wonderful. Zero marks, chips or scratches. Lettering and logo are perfect. You get to add the flaws. It has a high degree of polish and difficult to photograph. It measures 4 9/16" across by 3 5/16" tall by 1" deep. From my personal collection. For discounts...please try WalMart. Makes a great gift. Cards and PAYPAL are allowed on this item only. Please add 5% for their fee. PayPal and cards cannot be used with layaway. LAYAWAY price is $175 with PRIOR approval only. 60-days max. FIRST, please send message requesting layaway terms. No phone calls to start layaway process. Very similar to the Weatherby bullet blocks. Thanks!